Bradycardia is a heart rate lower than normal for a child’s age and activity level. Usually less than 60 BPM indicates bradycardia in a child, and if the child is experiencing this low of a heart rate with adequate oxygenation and ventilation, begin CPR immediately. It is often a sign of impending cardiac arrest in infants and children especially when accompanied by hypotension or evidence of inadequate tissue perfusion. Airway: Support or open the airway by positioning the child in a position of comfort and performing manual airway maneuvers if necessary. Breathing: Give O2 in high concentration, utilize bag-mask ventilation if needed/available and attach a pulse oximeter to assess oxygenation. 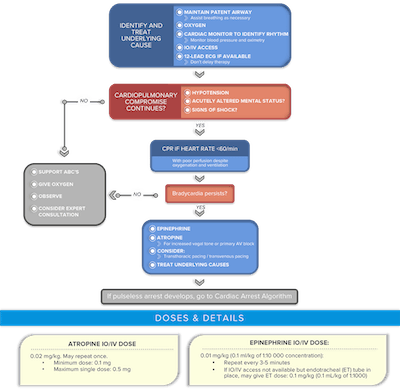 Circulation: Connect a monitor or defibrillator, establish an IV or IO, record a 12-lead ECG, monitor blood pressure and conduct appropriate lab studies (potassium, glucose, ionized calcium, magnesium, blood gas, toxicology screen). No, Bradycardia/Cardiopulmonary compromise does not continue:Support the ABCs as needed, administer oxygen, conduct frequent reassessments and consult a pediatric cardiologist. No, Bradycardia/Cardiopulmonary compromise continues:If the heart rate is less than 60 BPM and there are still indicators of poor perfusion proceed to Step 3. Purchase course for all algorithm steps. Our PALS practice exam includes questions pulled directly from a real PALS exam. 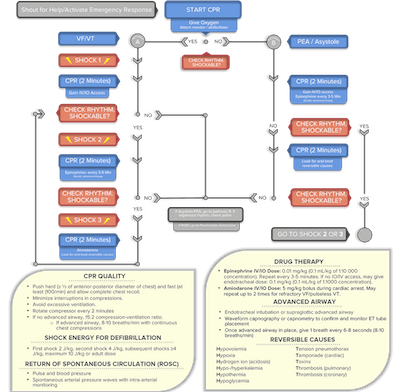 The Advanced Cardiac Life Support (ACLS) Recertification teaches medical professionals how to respond to nearly all cardiopulmonary emergencies. The Pediatric Advanced Life Support (PALS) Recertification teaches medical professionals to manage and respond to cardiopulmonary resuscitation of pediatric patients in emergency situations. The Basic Life Support (BLS) Recertification is intended to teach healthcare professionals the basic steps of CPR and rescue breathing for adults, children and infants. Cardiopulmonary Resuscitation, Automated External Defibrillator (AED) and First Aid Recertification is designed to teach adult and child CPR and AED use, infant CPR, and how to relieve choking in adults, children and infants. The Advanced Cardiac Life Support (ACLS) Certification teaches medical professionals how to respond to nearly all cardiopulmonary emergencies. The Pediatric Advanced Life Support (PALS) Certification teaches medical professionals to manage and respond to cardiopulmonary resuscitation of pediatric patients in emergency situations. The Basic Life Support (BLS) Certification is intended to teach healthcare professionals the basic steps of CPR and rescue breathing for adults, children and infants. Cardiopulmonary Resuscitation, Automated External Defibrillator (AED) and First Aid Certification is designed to teach adult and child CPR and AED use, infrant CPR, and how to relieve choking in adults, children and infants. Already Certified? Get a free reminder before it expires! 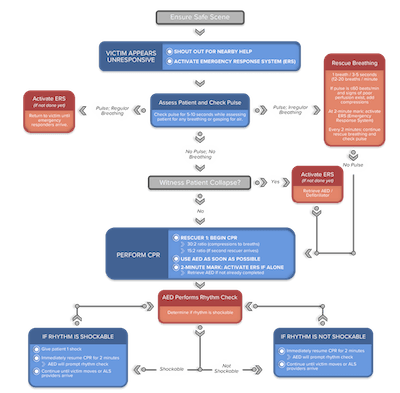 This algorithm describes the BLS sequence specifically for children and infants. There are key differences when compared to the BLS sequence for adults. Infants are not a newborn but less than 1 year old and children are older than 1 year old but younger than puberty. 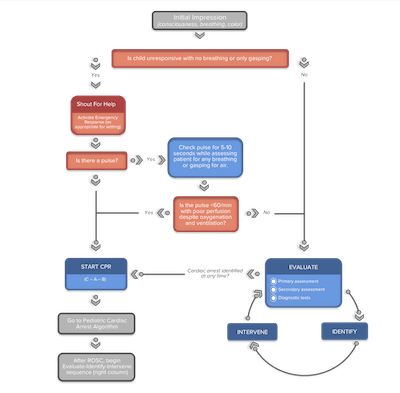 There are slight differences between the one and two rescuer algorithm for children and infants. 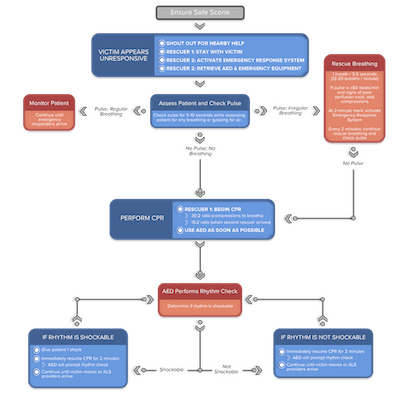 This algorithm highlights what makes a two rescuer situation unique. The PALS Systematic Approach is designed to provide a complete and thorough approach to the evaluation and treatment of an injured or critically ill child. It has several decision points and actions that must be committed to memory by PALS providers to ensure a high standard of care. 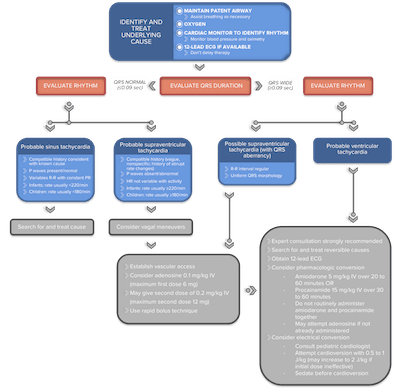 This algorithm outlines the decision tree for bradycardia, which is a heart rate (typically 60 BPM) lower than normal for a child’s age and activity level. It is often a sign of impending cardiac arrest in infants and children. Cardiac Arrest is the cessation of blood circulation due to absent or ineffective cardiac mechanical activity. Clinically, the patient is unresponsive, not breathing or only gasping, and there is no detectable pulse. Cerebral hypoxia causes LOC and failure to breathe. Agonal breaths may be observed during the first minutes after cardiac arrest. 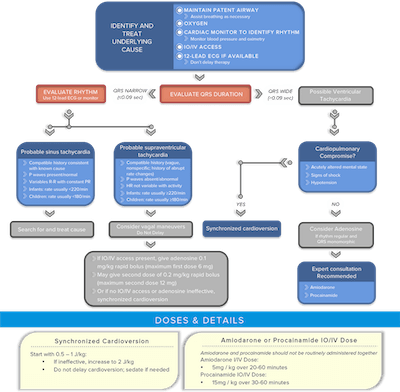 If a patient has a Return of Spontaneous Circulation (ROSC) or palpable pulse after resuscitation, start postresuscitation management immediately. The goals of postresuscitation management are supporting oxygenation and maximizing tissue and organ perfusion. 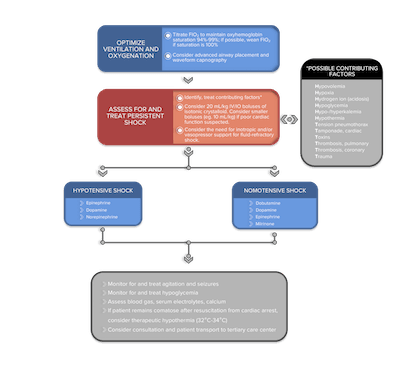 This section provides a systematic approach of the postresuscitation care algorithm. Tachycardia is a heart rate higher than normal for a child’s age and activity level. Like bradycardia, tachycardia can be life threatening for children and infants because of the impact on cardiac output. ProMed Certifications provides world-class medical education to Healthcare Professionals everywhere and currently offers certifications in ACLS, PALS, BLS, and CPR.